According to the assumptions of the current Technical Modernization Plan of the Armed Forces for the years 2013-2022, the Polish Ministry of National Defence should begin the implementation in the next two years of the three programs of warship acquisition: Czapla (translation: heron – building three patrol ships with the function of mines destruction), Miecznik (translation: swordfish – constructing three coastal defense vessels), and Orka (translation: killer whale – leading to the acquisition of up to three new types of submarines). Each of the three programs is crucial for the maintenance of the navy’s combat potential. Taking into consideration the officially declared interest in individual tenders and high promotional activity of several European shipbuilding companies on the Polish market, it can be assumed that almost all companies that build warships in Europe will offer their products (DCNS, Kockums, TKMS, Damen Shipyards). For several months now, the potential bidders have been trying to persuade the public, policy makers and experts of the superiority of one design of a certain classification over another. However, the current focus is, perhaps more appropriately, on the desired capabilities of the vessels rather than their formal classifications. Three Scandinavian countries may serve as examples of the profound transformation of the navy: Denmark, Norway and Sweden. At the turn of the 21st century, each launched a successful process of adaptation of naval forces to the challenges and needs of the new security environment. Today Denmark and Norway especially have the most modern naval forces of high combat potential, compared with other NATO countries, which are able to ensure the effective implementation of national defense purposes as well as actively participate, together with the EU and other allies, in stabilization operations (including Active Endeavour, Ocean Shield and Atalanta). Modernization and transformation achieved by the naval forces of Denmark, Norway and Sweden were initiated by a precise indication of their future tasks and areas of responsibility in national and allied defense system, and by drawing up a complete list of missions to be performed by the navy in the next decades in the territorial waters and beyond. The starting point for obtaining new generation units was to determine the expectations and needs in the field of operational-combat capabilities. Knowing what kind of capabilities should characterize the naval forces, it was decided to look for such technologies and naval units that would guarantee the achievement of the optimum level of national defense. Denmark decided to base its naval forces on two pillars: the forces specialized in the tasks of patrolling and surveillance missions of exclusive economic zone and the units for expeditionary operations (including overseas operations, but excluding war – Military Operations Other Than War – MOOTW). Norway decided to keep the maritime potential for participation in traditional military actions (the pillar in this case are Fridtjoft Nansen frigates specialized in destroying underwater targets and fighting against air attacks). Through the introduction of Skjold units to the service, the naval component was at the same time expanded and modernized. Its goal is to conduct activities offshore and in shallow water (littoral warfare). It assumes protection of the Norwegian coast and Norwegian waters, and also combats new types of threats (e.g. piracy). The Norwegian authorities in the process of modernization of naval forces also put an emphasis on modernization of the coastguard and equipping it with modern multifunctional units (Nornen and Harstad). In turn, Sweden, a neutral country whose naval forces operate mainly in the Baltic Sea, decided to equip its navy with units specializing in operations in shallow coastal waters, in an enclosed sea-basin under constant threat from the high prevailing naval forces and enemy aircraft. An example of this type of solution would be the Danish Knud Rasmussen patrol warships (two units in service, another under construction) and Absalon support ships (two units in service). Knud Rasmussen ships were created as relatively inexpensive units, from the beginning of the design process determined to operate in the Arctic waters around Greenland. The construction of ships, equipment, communications and command systems and deck’s architecture were designed for the specificity of the Arctic operating environment. The ships’ displacement, development capabilities of a large open aft deck and the use of systems for, weapons and equipment (Danish Standard Flex solution) allow for quick and easy reconfiguration of a vessel (in specific situations even transforming it into a combat ship equipped with missiles). Of course, Knud Rasmussen warships, even if re-armed and equipped with battle management systems, will never be comparable in terms of parameters with a corvette, but are able to successfully perform a wide range of combat tasks traditionally assigned to the warships of this class. On the other hand, Absalon vessels have a unique approach to multitasking, combining features that are difficult to incorporate in a single vessel. They can fulfil both functions of security and logistical support (including strategic transport and a command warship), as well as combat missions, with their potential comparable with the capabilities of frigates (they are armed with RIM-162 ESSM missiles launchers and Harpoon Block II anti-ship missiles). The individual cost of constructing both Knud Rasmussen warships (approx. 38 million euros) and the two Absalons (approx. 230 million euros), also proved to be lower than the price of warships of reputable suppliers offered “off the shelf” (respectively approx. 50 and 250 million euros). The plans of the development of the Polish Navy assume the acquisition of naval patrol ships, and in the longer term also a logistical support ship. Under the Heron program, it might be worth arming the Navy with patrol ships with similar features and built on a similar philosophy as the Danish units (specialized to operate in the Baltic Sea, but at the same time characterized by the possibility of rapid re-armament and transformation into a lighter corvette). Similarly, the Danish experience could be used in the process of acquiring a logistics ship. Instead of a specialized ship of support joint operations (expensive and costly to maintain), the Navy could consider the introduction to the service of a vessel which is conceptually equivalent to the Absalon. Such a step would not only give the naval forces a tool to protect the overseas operations of land forces, but also would fill the gap created by the withdrawal from the Oliver Hazard Perry (OHP) frigates. the operational assumptions, they will fight the enemy according to the concept of “hit and run”). The viability of these ships in clashes and the ability for covert actions allow them to effectively perform combat missions even in the case of superiority of enemy forces at sea and in the air. There are important differences between the Norwegian and Swedish structures. However, their design philosophy and the concept of use are similar. The Skjolds were created in the first place as offshore platforms, for carrying missiles to combat Naval Strike Missile – NSM warships (with a range of up to 180 km) which were manufactured by Kongsberg. The Visby ships are more multifunctional (they can perform exploration and combat missions with the use of torpedo submarines, support the special operations forces and conduct reconnaissance). The Visby corvettes were designed and built in such a way that, depending on operational needs, without major obstacles, and excessive financial expenditures can be adapted to perform different types of missions: fighting enemy surface vessels, anti-submarine warfare, detection and destruction of mines. But as in the case of the Skjold, their primary weapon are anti-ship RBS-15 missiles of Swedish construction (produced by SAAB). What is common in the philosophy of building Norwegian and Swedish ships is abandoning the belief that ‘classic’ ships of the corvette type can be a platform for carrying a full range of weapons guaranteeing the performance of almost every combat operations at sea. Therefore, when building a corvette type of ships it was decided that efforts should be made to make them a specialized types of units, based on precisely defined tasks and future combat missions they will be used for. 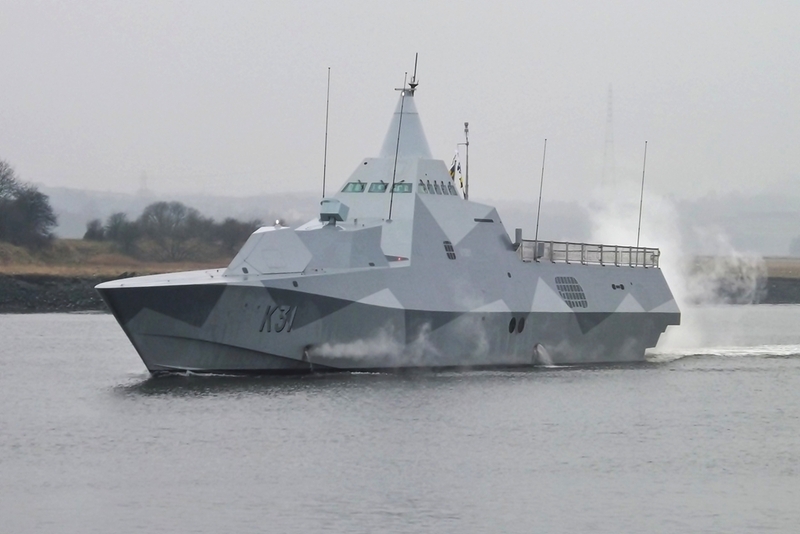 Swedish and Norwegian ships have proven in recent years that they might successfully be used in stabilization operations and operations to combat new types of threats. In all these cases, when the use of large units, such as a frigate, is not very effective from the operational point of view (even in the case of operations against piracy off the Horn of Africa), and it is also contrary to the principles of economics applied by the armed forces, light ships have appeared to be an excellent tool for power projection and implementation of the national security interests. In addition to the exchange of experiences, strategic considerations also speak for cooperation when modernizing the Polish Navy. The Russian-Ukrainian conflict as well as relations between the Russian Federation and the countries of Western Europe in 2014 have shown that it is in Poland’s vital interest to engage in any form of bilateral and multilateral military cooperation in its immediate vicinity. The three Scandinavian countries, Denmark, Norway and Sweden, are undoubtedly such natural partners. The doctrine of putting to use the naval forces of Poland, Denmark and Norway (in the dimension of defensive purposes and stability operations) is in many points identical in relation to the membership of the three countries in NATO. As for the navy, the hardware needs of Denmark and Norway have many similarities with the Polish ones. The ships built by Danish, Norwegian and Swedish shipyards have been repeatedly and intensively used in anti-piracy and anti-terrorist operations, where the validity of their assumptions has been confirmed. Their combat and operational qualities were also shown there. An important item in the catalogue of combat tasks and operational functions of the Norwegian and Swedish navy are tasks of war and defensive nature. They consist of fighting units of hostile states, fending off enemy attacks on sea targets, protection of sea routes. The Polish defense doctrine strongly emphasizes the possibility of a conflict that will directly threaten Polish sovereignty, territorial integrity or vital national security interests. Polish shipyards have experience in cooperation with the Scandinavian defense industry. In the last decade, they have produced hulls for warships ordered by the Danish and Norwegian shipyards (Northern Shipyard in Gdansk for Danish Knud Rasmussen patrol ships and Gryfia Shipyard in Szczecin for Norwegian Nornen patrol ships), which were then fitted with the necessary components and technologically advanced equipment before their final submission to the respective armed forces. Financial constraints mean that Denmark, Norway and Sweden preferred the cheapest possible solutions. As a result, Norwegian and Swedish producers are able to offer systems, structures and technologies in many cases cheaper than those promoted on the Polish market by other manufacturers. The existing industrial cooperation (including technology transfer) between Polish and Scandinavian arms producers, within the implementation of compensatory-offset commitments, has been successful (Norway’s offset obligations, related to the purchase by Poland of the NSM missile systems, have a value of 750 million PLN/180 million EUR). As well as being of benefitting Poland’s defence, taking advantage of the Scandinavian experience in the process of re-building the military potential of the Polish Navy may also provide an impetus for the Polish defense industry to engage in integration projects in the sphere of defense and security. These have been consistently implemented by the Scandinavian countries since the late 1990s. Polish combat aviation - maintaining the illusion? An Independent Kurdistan: Still a Dream or an Actual Opportunity?